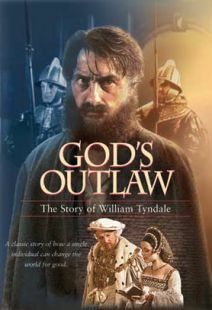 William Tyndale tops King Henry VIII's "Most Wanted" list in 1535 and is being pursued across Europe by the king's bounty hunters. What is his crime? Murder? Theft? No, none of these. William Tyndale's "crime" is translating the Bible into English for the common people. Is he willing to risk his life for this cause? This episode of The Torchlighters follows William Tyndale's adventures as he works in secret, moving from town to town as a fugitive to avoid capture. Friends and allies help him along, but enemies may be lurking around any corner. Come along and see whether this Torchlighter completes his task before the king's men close in on him. Fullscreen. The Torchlighters is an ongoing series of animated programs with strong values and educational content for youth ages 8-12. Each Torchlighters episode presents the story of a true-life hero from Christian history. Kids will see what God can do through a "Torchlighter" and will be challenged to carry their own torch while learning about the history of our faith. 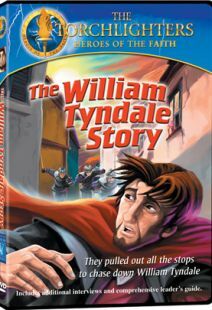 This realistically animated production describes the devotion of William Tyndale, a Christian. Tyndale was a language scholar in England in the 1500’s, a time when all copies and readings of the Bible were in Latin. The church and government authorities made it illegal to read or speak the Scripture in English, and those who did were prosecuted. However, Tyndale felt that the Bible was for all people, not only those who understood Latin, so he felt that it was his duty to translate it into English. After he was denied support from the Church, he secretly traveled to Germany to print his translation. 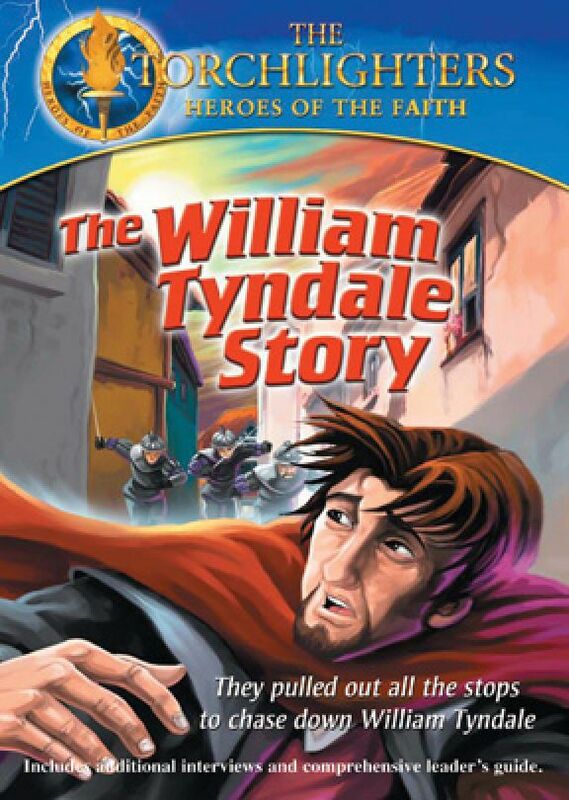 Tyndale was eventually betrayed and put to death in England. Soon after his death, however, the King approved the translation of the Bible into English, which led to the King James version. 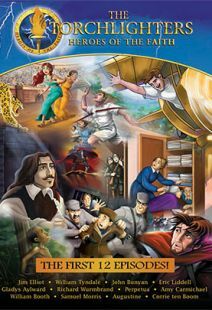 Bonus features of the DVD include English and Spanish languages with optional English subtitles, reproducible student handouts, quizzes, and more. The realistic animation, energetic characterizations, and fast-paced plot will keep viewers engrossed. Torchlighters DVDs and study guides are top notch. I can't wait to start showing and teaching them. 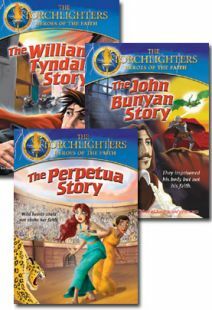 When we are finished, I am considering putting together a special program in front of the church with the kids about the Torchlighter series. I am not sure what that will be yet, but one thing I know is that because of the wonderful teaching guides you have provided, I have time to do things like this. Torchlighters is going to be the springboard for many exciting things our children will get to experience and share and I want to thank you again for creating such an amazing program of such quality. Everything is so well thought out and the artwork is beautiful. I know the parents will immediately see that we have chosen an exceptional program and the kids will be thrilled to see the posters start going up around the church. Just a quick note to say thank you so much for producing these DVD's!! Our 3 children (aged 6, 4 and 2) watch them constantly and it cheers our hearts to hear them play Amy Carmichael rescuing Preena instead of Cinderella and Snow White! (in fact our 2 year old son goes around the house yelling, "let me go, let me go!" which he learned from that movie!). We wanted something in our home that would enrich our children's lives and give them missionary hearts, and these movies do that perfectly. We have recommended them to all the families we know who have children. We are already looking forward to John Wesley! Our family has watched your DVD's for years and we have been SO blessed by your materials!! We are so grateful that you've provided a Christian look at history, showed us stories of brave Christians, and built our faith — one episode at a time. And we thank you for stepping up to do this and providing <b>excellent</b> children's DVD's — a very rare thing indeed!